The Salford Institute for Dementia campaigns to change the way people live with Dementia. 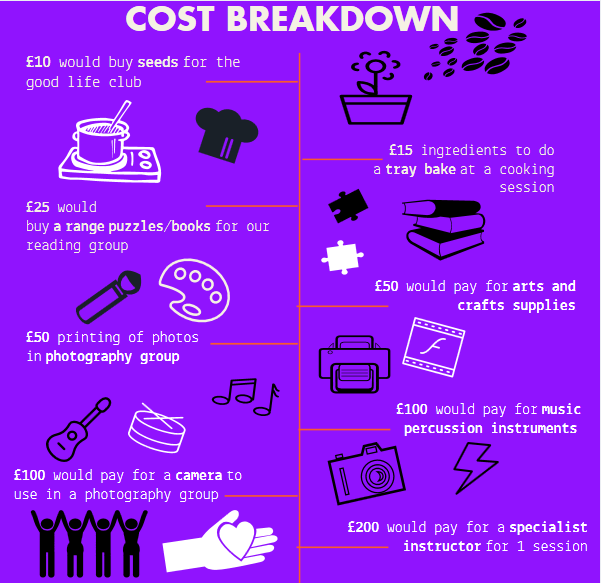 We are aiming to raise donations for equipment at the Hub, such as arts and craft supplies, a camera for the photography club and specialist instructors to run exciting sessions. The Dementia Hub was opened in 2017 as a result of philanthropic support. 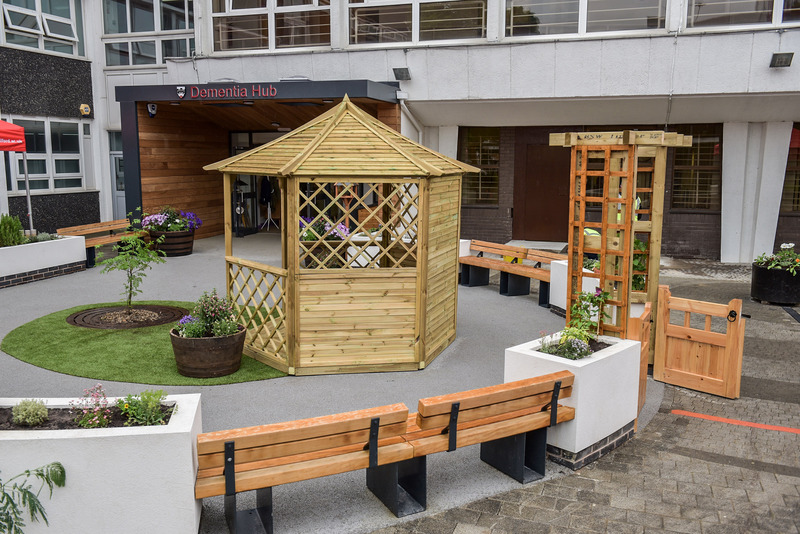 It was built as a place for people with dementia and their care partners to gain a sense of community, whilst providing the facilities and support they need to live well . At the Salford Institute for Dementia, we are proud to be enhancing the lives of people living with dementia, through creating innovative ways to eradicate the fear and stigma surrounding a diagnosis, allowing people to look beyond dementia by seeing the character and not the condition. The Institute has a unique and multidisciplinary approach and is wholly dedicated to working in communities and developing practical solutions to help people with dementia to live life to the full. The Music Café which every month arranges a show with a different genre of music. The Music Café encourages creativity, as visitors can come down to enjoy a wide genre of music and even have the chance to learn new instruments! The SIDs Café which is a place for people living with dementia and their care partners to come and enjoy a chat and some fun, over a warm drink and some cake! The SIDS Café also offers a varied programme of social activities including arts and crafts, baking, quizzes, music, dance, photography, and visits from local organisations such as Community Support Officers. The Good Life Club is focused around our dementia friendly garden. Our club members plant and grow their own seeds and veg, which is then used during cooking activities! This encourages members to look after themselves by eating a healthy varied diet, promotes the benefits of gardening as a way of relieving stress and anxiety and encourages everyone to socialise with old and new friends! The hub creates a community where everyone feels valued and supported. One of our members explained why the hub is so important to them. The life changing work that the Dementia Hub does can only be accomplished with the generous donation of our supporters. If we raise £550, we can buy the necessary equipment for these activities to continue to have a profound impact, through making sure that people can live well and have a fulfilled life beyond dementia. Your donation truly does make a huge different to those living with dementia. £200 would pay for a specialist instructor for 1 session. Any further donations received would enable us to extend the remit of activities, such as a larger choice of books for our reading group. We could also buy new equipment such as an Ipad (£500) for lessons in technology, which gives members valuable skills. …during Dementia Action Week we are aiming to create a dementia friendly world and support for our Hub, but to do this we need your help! We need to make sure we are all taking action to change the way people live with dementia. Your donations will fund the equipment needed to continue the café and clubs at the Hub which makes a profound impact in the lives of people living with dementia and their care partners. Your donation – whether it is £5 or £500 – can make a difference in changing the way that people live with dementia. Together we can believe in a life beyond dementia. You will receive a shout out on our social media platforms thanking you for your support! Receive a shout out in our annual donor magazine, Impact, thanking you for your support!